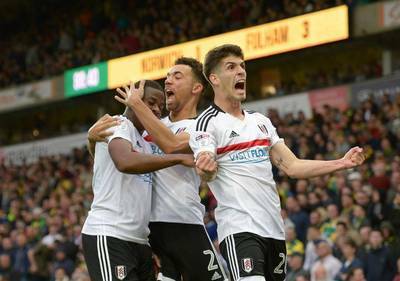 Fulham have sold all 2,000 tickets for the Good Friday trip to Carrow Road. As a result, there will be no matchday sales to away fans on the gate. Carrow Road is clearly signposted for drivers from the A11 and A47. After exiting the A47, also known as the southern bypass, use the A146 to head into Norwich. At the traffic lights turn right for the city centre on the A1054. At the next roundabout, remain in the left-hand lane and head towards the city centre on the A147. At the following set of traffic lights, turn right into King Street. The road becomes Carrow Road as it crosses the river and the ground is clearly visible to your right.There is very little parking at Carrow Road so the best car parking option will be at Norfolk County Hall (£8), which is well signposted from the A146. Although there are around 2,000 spaces, it is advisable to get to car park by 1pm as it is usually full by 2pm and an early entrance can cut down your departure time after the final whistle. Supporters are advised that there are engineering works affecting the Greater Anglia line between London Liverpool Street and Norwich over the Easter weekend. Some trains have been cancelled and return journeys may have to be made via Ely. All Fulham fans are advised to check for delays or alterations before travelling. The official Club coaches from Motspur Park and Craven Cottage to Carrow Road have all sold out. Unfortunately, the traditional away pub the Compleat Angler is now under new management and admits home fans only. Close to Norwich train station, the new away haunt is now the Prince of Wales (8-14 Prince of Wales Rd, Norwich NR1 1LB), which is a traditional Greene King pub, with big screen TVs showing live sport, and a good range of beers and reasonably priced food. The Queen of Iceni (6, Riverside Development, Norwich NR1 1ED) is the nearest Wetherspoon’s to Carrow Road, located on the river in the new Riverside development. Lollards Pitt (69-71 Riverside Rd, NR1 1SR) is also located in the new Riverside development, but is well worth a visit, with an wide selection of beers and ales, and plenty of space for supporters to congregate with a pool table and the opportunity to drink outside as well. The Coach and Horses (82 Thorpe Road, Norwich, Norfolk NR1 1BA) is just four minutes walk from Norwich train station and is well worth a visit as it brews its own beer. The pub, which is listed in the CAMRA good beer guide, offers a decent array of real ale, lagers, wine and soft drinks as well as excellent food menu and regular live music. The Fat Cat and Canary (101 Thorpe Rd, Norwich NR1 1TR) also features in the CAMRA good beer guide. All the real ales are listed on an expansive chalk board beer menu with five regular ales on tap, Sky Sports and BT Sport on TV, front and rear terraces as well veranda seating outside and a large car park. For those Fulham fans heading straight to the ground, the alcohol available inside Carrow Road includes Carling (£4), Stowford Press (£4.50), Worthingtons (£4), White, Red or Rose wine (£5), Vodka & Coke (£5), Gin & Tonic (£5), Wherry Beer (£4.50) and Rekordalig (£5). For those of you staying in Norwich over the Easter weekend, there are a number of other local attractions that might be worth visiting. Norwich Castle Museum: Norwich Castle is renowned for its impressive architecture and is top of the tourist list for many visiting the area. Norwich Cathedral: The most complete Norman cathedral in England and one of the finest examples of Romanesque architecture in Europe, this cathedral is one of England’s finest. With over 900 years of history, explore the Cathedral building and discover the largest Cathedral Close and monastic Cloisters in the UK. The Forum: This impressive building is home to the region’s BBC platforms and studios and the Norfolk & Norwich Millennium Library. The Forum also contains a restaurant, a café and is where the local Tourist Information Centre is located. The amphitheatre steps at the front of The Forum and the building’s atrium are home to many exhibitions and performances. Shopping: Norwich is one of the top UK shopping destinations with a mix of both high street names and individual boutiques, as well as the largest open-air market in England. Norwich Market has been in operation for over 900 years, with its iconic coloured roofs and local produce. The two main shopping centres, Chapelfield and Castle Mall, are just a five-minute walk from each other. The Lanes: The Norwich Lanes are a series of alleyways and open communal spaces set just a few steps away from the imposing clock tower of Norwich City Hall, which overlooks the market. The medieval architecture is some of the finest to be found anywhere in the UK. Today the lanes are home to a thriving independent retail area and a vast array of cafés, restaurants and bars. Tombland: Once the site of an Anglo-Saxon market place, now the hub of nightlife in Norwich, Tombland is full to the brim of bars and restaurants sure to please, both night and day.Other sites worth a visit include The Great Hospital, The Halls, The Guildhall, Dragon Hall, The Assembly House, St James Mill, The Cathedral of St John the Baptist, Surrey House and City Hall.